Sustainable Brands kindly invited me to speak at their Boston New Metrics ’14 conference. They asked me to lead a panel called “Tapping the Crowd for Insights and Solutions: Crowdsourcing, Crowdfunding, and the Personal Data Economy.” I got to work with three experts: Gwen Nguyen, Cause Director, Indiegogo; Reki Hattori, CTO, Datacoup, and Dr. Thomas Malone from MIT’s Climate CoLab. It was fun to work with them and I think both I and the audience learned something from our presentations and discussion. We at CSRHub had recently posted research on the relationship between corporate social responsibility (CSR) and crowdfunding. However, the SB folks wanted me to talk about how crowd data could influence sustainability metrics. This is a topic we care about deeply—we have already integrated more than a quarter million pieces of crowd data into our database. I started by pointing out that we already have many good sources of sustainability information. In fact, there are almost too many for anyone to track via normal means. CSRHub currently lists >330 sources in our system, and that number grows by three to ten sources per month. 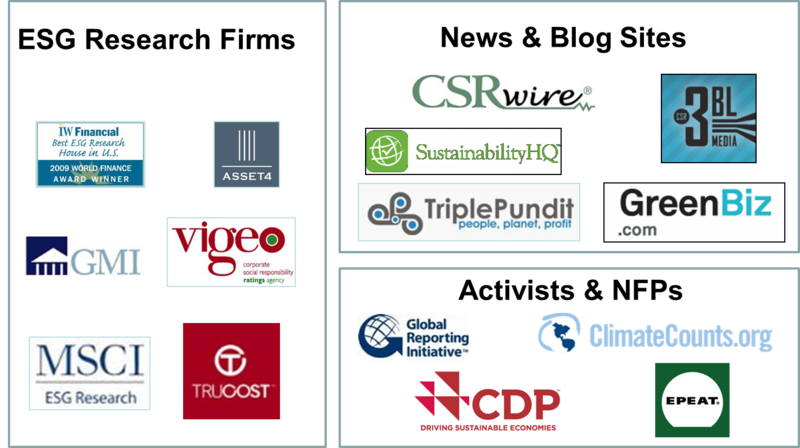 CSRHub gathers all this data into one place, harmonizes it, and makes it useful to sustainability practitioners. We’ve recently grown our coverage to include more than 9,000 companies in 106 countries. 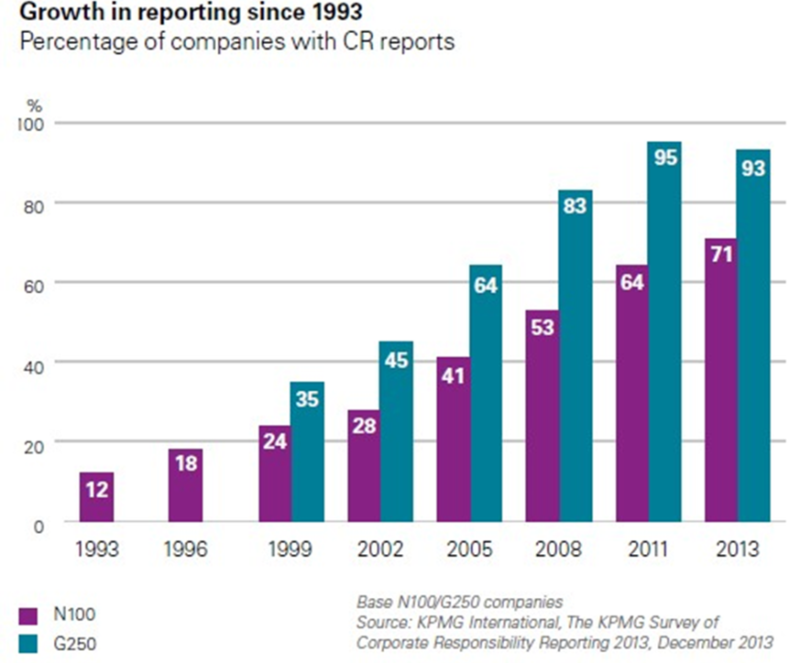 Ten years ago, only a few large (or very socially-minded) companies issued corporate responsibility reports or reported their performance to groups such as GRI or CDP. These days, thousands of companies have employee-driven community service programs, recycling and carbon reduction targets, and sustainability areas on their web sites. As you can see below, after twenty years of progress, more than 90% of the Global 250 issues CSR reports. Hundreds of thousands of middle-sized and smaller companies—many of whom are privately held or not-for-profit organizations—are starting to report their social performance to their customers (via sustainability supply chain systems) or to local or national government organizations. 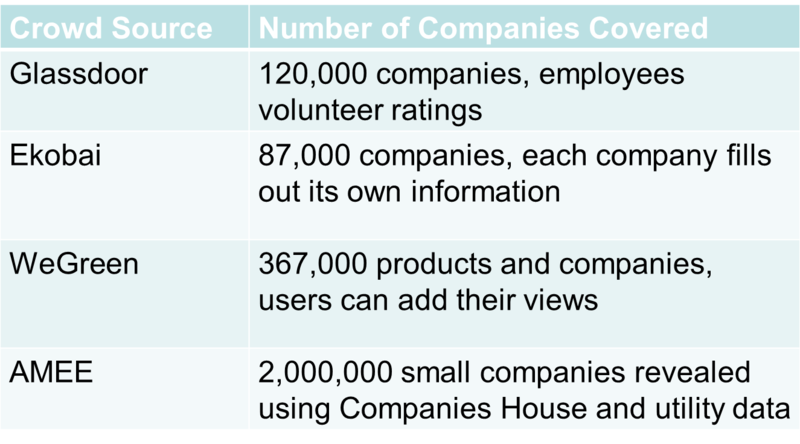 In contrast to the situation with bigger companies, most of the new data that smaller companies generate is never made public. 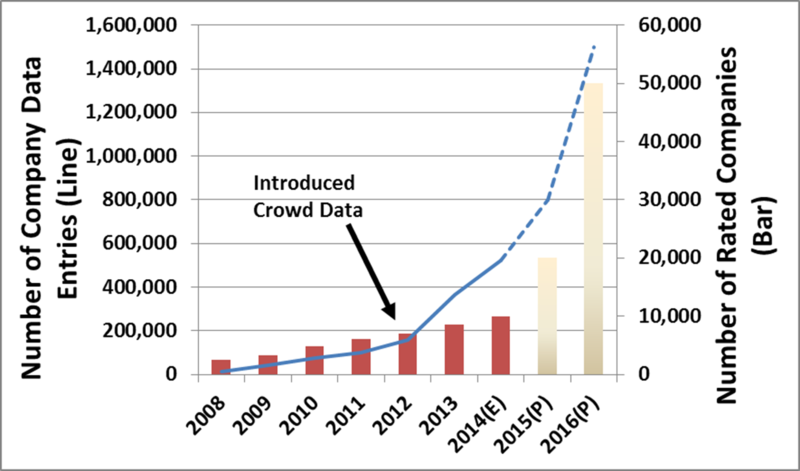 This has left a big gap that we believe crowd data can help fill. Crowd sources monetize in various ways. For instance, Ekobai charges companies to list on its site, WeGreen captures a small part of the consumer purchases it helps direct, and Glassdoor sells job ads. To generate the traffic and attention they need, crowd sources typically cover both larger, well-studied companies, and smaller ones. 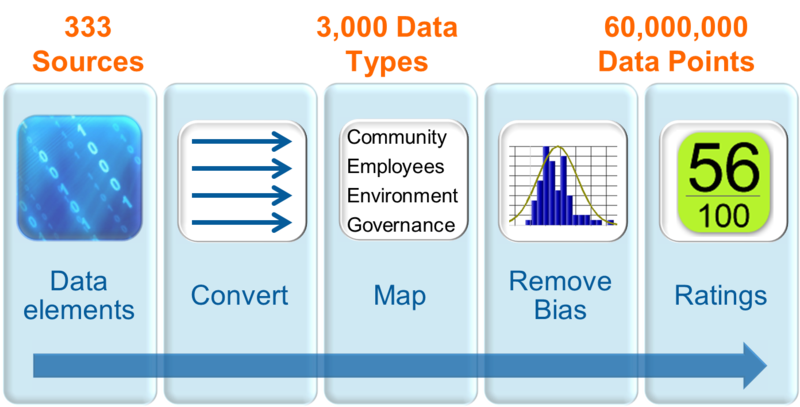 We already use the data on one company to standardize and normalize the data on other companies. We can therefore use our non-crowd expert sources to understand and adjust the ratings we get from crowd sources. As a result, we should soon be able to track at least 50,000 companies and hopefully soon have ratings on hundreds of thousands of companies, both public and private, from around the world. Sustainability ratings and metrics are vital for making a number of business decisions. By broadening the number of companies that can be rated, we should be able to enable faster and more accurate supply chain management, improve private investment decision-making, and encourage consumers to shift their purchases towards more sustainable products. Most people seem to feel that consumer rating and credit management systems have improved our ability to make business decisions. Broad-based sustainability ratings, based at least partly on crowd data sources, should generate similar long-term value for everyone.